I created these last year for a guest post. I'll go ahead and post them here for you this year!!! Here are 3 super fast, super easy hair clips you can create in no time flat. 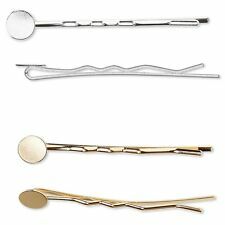 The bobby pins look like this and you can get them at any craft store. I used E 6000 glue... the stuff is the bomb! The glue is loose enough, that if you don't balance your pin upside down to dry, it will slide around, so be sure to stabilize it while it dries. I used these foam type spiders that I got at the craft store. I'm actually not sure what material they are made from, they are more stiff than foam, which is nice for your hair. Anyway, I used some hot glue to attach this spider to a little snap clip. I got a whole sheet of them from the dollar store. Is that too easy for you? Good, because the last one is a little more involved... but don't be scared! It is super easy to make and super cute. 1- Make 2 small traditional bows with half inch ribbon of your choice. We are going to connect them in the center with a dot of hot glue. Make an x with them. Did you know you can get spools of tulle? Love working with it! I only have to cut length. For the clip part I cut out a circle from felt, cut slits in it, then put my clip through. I finished off the center with a sparkle gem, just glued in. There we go... 3 easy hair clips so we can all have some festive in our hair!